Pterois is a marine fish, commonly known as lionfish they are also called zebra fish, fire fish, turkey fish or butterfly-cod. One of the most attractive fish species it has quite long red and white stripes. Lionfish is native to Indo-Pacific region they are found in various colours the stripes of the lion fish helps them to defence against enemies, this type of fishes are also quite venomous in nature. The venom of the lionfish is delivered via an array of up to 18 needle which is like dorsal fins, is purely defensive. It relies on camouflage and lightning fast reflexes to capture prey mainly small fishes and shrimps. A sting from a lionfish is extremely painful to humans and can cause nausea and breathing difficulties but is rarely fatal. Lion fishes have power to make instant movement in water this helps them to catch preys easily. The size of lion fish ranges from 11 to 15 inch and weighs up to 1.5 kg. There are around 8 different recognised species of lionfish that are found in the Pacific Ocean. The lionfish is natively found in coastal waters around rocky crevices and coral reefs where there are lots of smaller fish for the lionfish to eat and also places for the lionfish to hide. Lionfish are popular in some parts of the world as food they are also popular aquariums around the world. 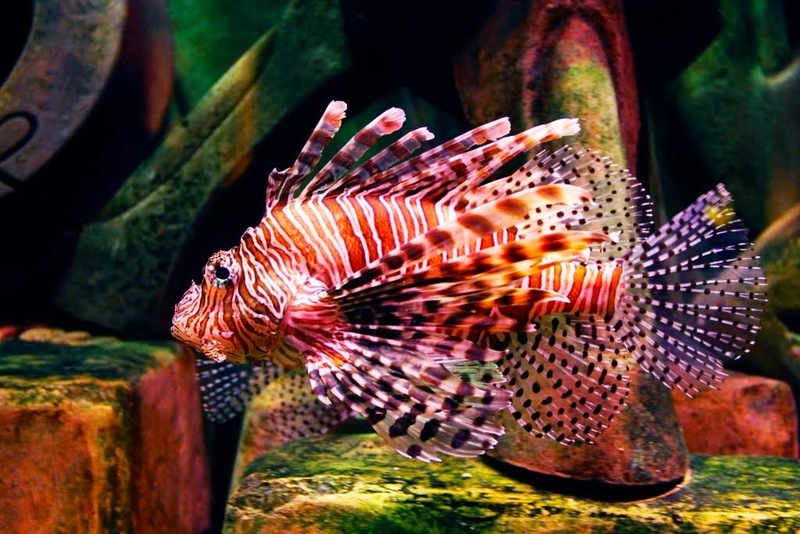 Most lionfish are better kept in tanks with lots of space and few other fish. Lionfishes can live to around 16 years in the wild and lionfishes often live longer if looked after well. The largest of lionfish can grow to about 15 inches 0.4 meters in length, but the average is closer to 1 foot 0.3 meters.